Did You See Seacole CEO Gregg Elliott at the State of Manufacturing® Last Week? 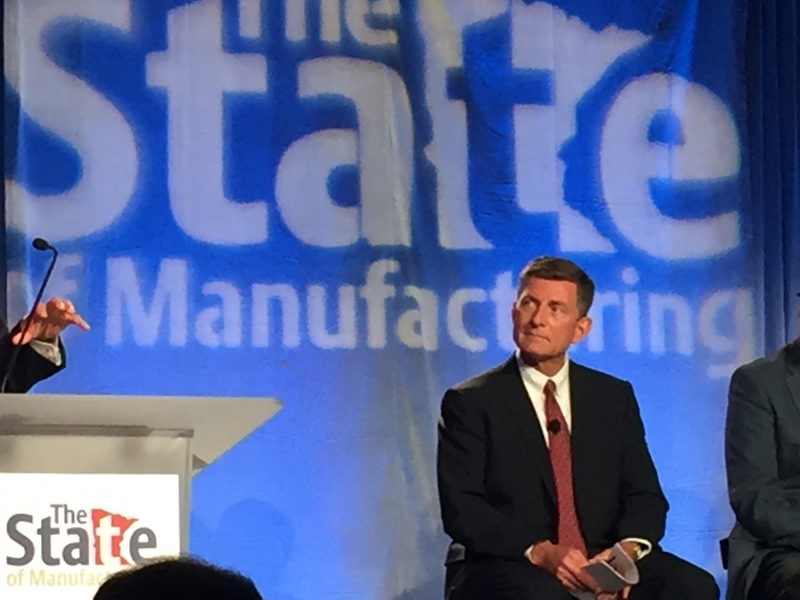 Seacole founder and CEO Gregg Elliott was honored to be a part of the expert panel at this year’s State of Manufacturing® event in Minneapolis. The State of Manufacturing® is the flagship event for Enterprise® Minnesota. Seacole has a longstanding relationship with Enterprise® Minnesota, which helped us achieve our ISO 9001:2015 certification. Here’s a list of five things you likely didn’t know about Seacole and Enterprise® Minnesota. Seacole’s been featured twice in Enterprise® Minnesota Magazine. It’s true! Both articles featured our journey toward ISO 9001:2008 certification. One, “Chemical Manufacturer Seacole Uses ISO to Help Ramp Up to $35 Million in Revenue,” described how we came to the decision to pursue ISO certification. For us, getting ISO certified was a customer-driven process. The second article, “Chemical Reaction,” described how our ISO 9001:2008 certification has transformed our operations and culture and increased our revenue. Much of this revenue growth is due to attracting larger enterprises with our ISO certification. Seacole recently achieved our ISO 9001:2015 certification to build on this success. The State of Manufacturing® is celebrating its 10-year anniversary this month. For a decade, Enterprise® Minnesota has held this annual event for Minnesota manufacturers. The purpose of the event is to share the insights, concerns, and predictions of the more than 400 manufacturers Enterprise® Minnesota surveys each year. Topics include not only manufacturing but the economic, regulatory, and political issues affecting manufacturers in Minnesota. Seacole’s ISO 9001:2015 certification helps us serve larger customers more effectively. This was one of the major reasons why we chose to pursue ISO certification. Gregg Elliott had been considering certification for a while. But it was a request from a major prospect that pushed him to make the leap. The company was enthusiastic about working with Seacole, but we needed to be ISO certified before they could commit. Our ISO 9001:2015 certification shows all our clients that our process is thorough, efficient, effective, and reduces errors. A happy byproduct of ISO certification is its high employee engagement. Everyone understands their roles and expectations and has a voice in the process. Ultimately, this helps us deliver a better product and create a better customer experience. Enterprise® Minnesota helps small and medium-sized manufacturers grow. We’re very thankful for our partnership with Enterprise® Minnesota. With their help, we’ve achieve ISO certification and had doors opened for our company that would have otherwise been closed. In 2017, we had the pleasure of hosting Representative Erik Paulsen at our 85,000-foot facility in Plymouth, Minnesota. After a tour of our facility, Representative Paulsen sat down with our team to discuss legislative and regulatory matters that affect Seacole and its customers. We’re deeply grateful for the opportunity to share our concerns and successes with someone who can make a difference for our business and community. Gregg’s appearance on last week’s State of Manufacturing® expert panel was his second speaking event for Enterprise® Minnesota. In addition to last week’s State of Manufacturing® panel, Gregg’s appeared at two Enterprise® Minnesota’s ISO 9001:2015 – From Compliance to Performance business events in the Twin Cities. He’s appreciative of the opportunity to share Seacole’s success and build our partnership with Enterprise® Minnesota. For more information on our ISO certification, Enterprise® Minnesota, or to place an order, contact the Seacole team today. https://www.seacole.com/wp-content/uploads/2018/05/IMG_0352.jpg 2448 3264 Amanda Lanser https://seacole.com/wp-content/uploads/2016/01/mainlogo.png Amanda Lanser2018-05-23 10:00:492018-05-23 21:09:27Did You See Seacole CEO Gregg Elliott at the State of Manufacturing® Last Week?